Dedham wants to jettison a 40-acre piece of property slated for a large-scale residential development because, officials said, the town can't afford to educate all the children that might move in. On the other side of the border, Menino has been pushing for more affordable housing in Boston. The prospect of 1,850 family-friendly units in the new residential development is tempting to some people, since much of the new housing being built in Boston is luxury units. In this quote, Menino mentions how important it is to plan the development and make sure it works for the existing residents of the area. The campus neighborhoods that BC and Harvard are planning in Brighton and Allston need to be held to the same standard - well-planned and done in concert with the people who live here. So far, many people would say that these campus neighborhoods have not been well-planned (if there is any plan at all) and the existing residents have been ignored in key issues. 154-162A Brighton Ave: Increase the patron occupancy capacity of the restaurant to five hundred and twenty-five patrons, and add entertainment. 157-171 Brighton Ave: Change the legal occupancy from a restaurant #37/38 and five stores to a restaurant #37/38 and three stores. 97-99 Colborne Road: Remove existing deck and erect and extend the deck. 80 Lake Shore Road: Erect a rear addition to a one-family dwelling, and erect a deck. 2 Emory Street: Outdoor storage of sixty vehicles. 19 Brooksdale Road: Create off street parking for two vehicles. Call the Board of Appeal at 617-635-4775 for more info. The City has been doing a ton of street repaving around here. Much more in one season than I have ever seen before. Harvard has made some improvements to its campus near where it borders the neighborhood. Here are a few new bushes along Riverdale St. The Riverfest & Summer party at the Honan Library were both wonderful community events. Great opportunities to see our neighbors, learn about the good work that many organizations are doing here in Allston and Brighton, and to appreciate the Charles River and Honan Library, two of the treasures of our neighborhood. 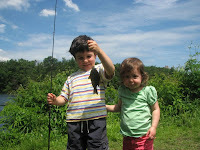 Our kids particularly enjoyed having The Fishing Academy at the Riverfest. Click here to visit the Harvard website and download this report in PDF format. Public broadcaster WGBH Boston said it has "flipped the switch" and begun complete broadcast operations at its new all-digital studio complex in Brighton. For the past two weeks, WGBH has been broadcasting television programs from its long-time studios in Allston, but the Allston operations ceased yesterday as WGBH's two analog TV stations - WGBH 2 and WGBH 44 - and their two digital counterparts began broadcasting from the new studios. For 4 years, Harvard has been trying to get City approval to build a 45,000-square-foot research facility a 14.2-acre lot next to the Arnold Arboretum. It seems like a big project to the neighbors in Roslindale, but it seems so small compared to the ten times larger Science Complex that Harvard wants to build on Western Ave in Allston. When I attended a meeting about this project last winter, Harvard was offering a 100 year restriction on a part of this lot that would not be developed as part of this project. Kevin McCluskey and other Harvard staff at that meeting along with Jay Walsh (Paul Holloway's boss in the Mayor's Office) seemed to strongly support of the 100 year restriction. Residents who pushed for a much longer restriction were basically told that could never happen and Harvard (or any other property owner) would never voluntarily agree to such an outrageous restriction on their private property. So the impossible is now the reality! Harvard has gone from offering a 10 year deal, to a 40 year deal, to a 100 year deal, to a 875 year deal! restrictions for the land where the facility is proposed. commitment was not acceptable to community members at past meetings. The Schofield for City Council campaign is holding a Neighborhood Kick-Off on Thursday, June 28, 2007 from 6:30PM-8:30PM at the Green Briar, 304 Washington Street, Brighton . No donation required. Looks like a couple of not-small car crashes on Cambridge Street have done some recent damage. As the sign reminds us, this is Harvard property, and hopefully the damage will be repaired soon. 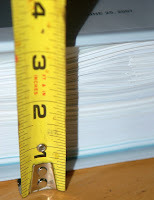 Here is it - 3 inches thick weighing more than a few pounds. Hopefully copies will be online at http://allston.harvard.edu/ and the BRA website soon. Officials at the Oak Square YMCA last week cut the ribbon on Brighton's newest teen center. Greater Boston YMCA Executive Director Jack Fucci called the summer program at the Brighton Y "one of the most progressive youth programs in Boston." 1) Do you support the creation of a Boston Planning Department? I would vote in support of holding hearings to evaluate the creation of an independent planning department for the City of Boston. 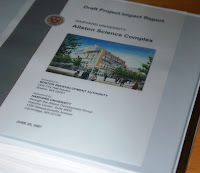 2) Should height limits in the North Allston Strategic Framework be strictly applied to Harvard’s proposed buildings? The NASF height restrictions should be adhered to. However, any flexibility built in to the framework should only be linked to community benefits and support. 3) Should City Council approval be required before a university can purchase property in Boston? It would be great if the City Council could have influence on such purchases. It is my understanding the City Council has no authority on property conveyances. Universities should refrain from purchasing any residential property in the City. 4) What are your thoughts about a possible Charlesview relocation? 1. The relocated residents are satisfied with the location and apartment amenities. 2. The abutters of the new location are satisfied that the density and impact to the neighborhood makes sense. 3. A consensus is reached that the quality of life for the residents and the neighborhood is improved. 4) What should be the future of the Speedway property on Western Ave.? The Department of Conservation and Recreation has oversight of this property. I would work with our state elected officials to negotiate a conveyance of this property to benefit the community and preserve its historical significance. 5) How do you feel about the vacant Harvard-owned properties in North Allston and North Brighton? All Harvard owned property should be properly maintained inside and out. There should be efforts made to have their buildings occupied by businesses that will employ our residents and enhance small business opportunities. The Task Force has formed a sub-committee to examine this issue. Harry Mattison, Millie McLaughlin, Mary Helen Black are members representing the community. Comments: Since first introducing the concept in 2004, I continue to be the Council’s leading advocate for this much-needed reform. As directed by the Boston Redevelopment Authority, the City’s “planning” process is deeply flawed. A focus on institutional and commercial development has led to an affordable housing crisis while too little is being done to preserve the city's remaining open space. A proliferation of tax-exempt properties and a lack of any real economic planning has hurt our City’s finances. For these reasons, I am the lead sponsor and author of a Home Rule Petition which would create of a City Planning Department to promote community-planning and housing development. With a new Planning Department, Boston would have comprehensive, long-term, need-driven (rather than project-driven) and community-based planning, and housing production would regain prominence. For a copy of the Home Rule Petition or for more information please contact my Chief of Staff Jamie Willmuth at (617) 635-3115. Comments: I remain extremely frustrated and disappointed that the BRA and the City too often treat community Master Plans as mere guidelines and commentary rather than granting them the respect these comprehensive planning documents deserve. The process of creating this Framework began in 2001. After many meetings and much hard work, the Community Planning Group of dozens of local residents created a vision for the area that maximizes opportunities for North Allston and all of Boston. The planning group, appointed by the Mayor, was representative of residents, businesses, institutions, and non-profits with interests in the area. Their work deserves more respect. Comments: I am the lead sponsor and author of the University Expansion Moratorium. This legislation would empower the City’s Institutional Expansion board to enforce a conditional moratorium on any College or University expanding to property not currently owned by a tax-exempt institution. The City of Boston proudly hosts a student population of well over 200,000. Our colleges and universities own just a small percentage of land in the City, have a major positive impact on our economy, and must sometimes expand to meet the needs of growing student populations. Nevertheless, in the past decade, Boston has experienced rapid and almost uncontrolled expansion by almost every major College and University. This growth significant concerns about local tax revenues because colleges and universities are tax-exempt. I remain very concerned about the proposal to move the Charlesview Apartments and it’s nearly 600 residents to another location. Though the current site is in need of repair, I sympathize with the tenants who to not wish to relocate to the Brighton Mills or any other another location. I continue to hope that a sustainable solution can be established which will satisfy the current tenants, the Chalesview board, and Harvard University. All sides should continue to carefully explore the merits of proposed alternative sites, such as the Kmart site, in an effort to reach a mutual agreement. 5) What should be the future of the Speedway property on Western Ave? It’s my understanding that this is largely a state issue that Representative Moran is addressing. I would not necessarily oppose Harvard or another entity purchasing this property. Whoever purchases the property should ensure that it is re-developed in accordance with the community needs and vision. No bid should be accepted from anyone who does not agree to an appropriate re-development. 6) How do you feel about the vacant Harvard-owned properties in North Allston and North Brighton? I share the community's concerns about these properties. Certainly, I believe that Harvard has an obligation to tell the community about its intended use of these properties particular as they ask for approval of a new 50-year Master Plan. I am committed to working with community leaders to explore whether the City should consider taking and developing these parcels should Harvard indicate it has no plans for the properties. As with all vacant lots, the Department of Neighborhood Development has a responsibility to ensure that these properties are properly maintained and developed. A subject that had little discussion at Harvard Task Force meetings is how the Science Complex buildings will interact with the public. Harvard has started to show us more images of the entire building viewed from across Western Ave from a block or two away. These views are important and we should look at these in more depth. But how might it feel to walk past the buildings? What will you see when you look at them from up close? Are there businesses or other public uses that attract people and welcome us in or do the building encourage us to keep walking past them? 1) Cold Shoulder - These buildings come right up to the edge of the sidewalk and offer no opportunity for the passer-by to enter. In many cases the look is industrial or spartan and it is always very private. "This building is not for you", they say. 2) Quiet Green - Just as private as the "cold shoulder" buildings, these buildings are set back from the sidewalk. Trees, grass, and other plants grow between the building and the pedestrian's sidewalk. In general these remind me of a quiet suburban office park. 3) Welcome In! 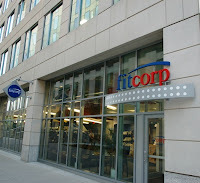 - Here are buildings that put public uses on the ground floor, usually with large windows looking into the activity. Many restaurants in this category have outdoor seating areas. Signs and window displays attract people and announce the public access to the building. 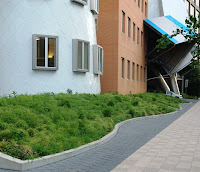 An advantage of the Science Complex's 4 building design is that it increases the perimeter of the buildings at ground level. This creates more places to create public spaces and interaction than if there was one single larger building. But there have been few details from Harvard about taking advantage of these opportunities, which from the community's viewpoint, could make these buildings great. Science Complex design presentation - This presenation includes new images of the proposed buildings and information about the building heights. The buildings range in height from 126 to 83 feet. (These numbers include the mechanical equipment on the roof that extends 20-30 feet above the roof of each building). The smokestacks (or chimneys or whatever you want to call them) on top of the buildings add another 20 feet or so to each building, so when these are included the tallest point above the sidewalk will be 150 feet. This year's neighborhood garden tour is Saturday, July 7 from 10-4. Tickets are $10 in advance or $15 on the day of the event. For more information call 617-787-9844. Comments: Probably, but such a measure would be unconstitutional. We, unfortunately, cannot stop the move. I support the best deal for the Charlesview residents. The deal between the Charlesview Board and Harvard does fulfill the mission of safe, quality, affordable housing. As a preservationist, it is my opinion that once a developer is chosen for the site, I will fight vigorously to see that they restore the majestic property to its original condition. That location serves as a gateway to the Brighton and Allston neighborhoods and, as such, should reflect that. Members of my staff live in that neighborhood and relay the major inconvenience in Harvard’s mothballing of property. Many people enjoyed the convenience of shopping at Shaw’s and walking to K-Mart. That convenience has been taken away by Harvard. The James Jenner for City Council campaign will hold a kickoff fundraiser at The Kells on June 28th from 7-10pm. James Jenner (jennerforcitycouncil@yahoo.com) is the first City Council candidate to respond to the questionnaire below. These questions were sent to all candidates for Allston/Brighton and At-Large candidates on June 7. More responses will be posted as they come in. Do you support the creation of a Boston Planning Department? Should height limits in the North Allston Strategic Framework be strictly applied to Harvard’s proposed buildings? Should City Council approval be required before a university can purchase property in Boston? What are your thoughts about a possible Charlesview relocation? I have spoken with many of the residents of Charlesview and the overwhelming message I received was that they are not chess pieces that can be moved just for the betterment of an overall strategic plan. Charlesview is their home and even moving just down the road is replacing their home and memories. I am strongly opposed to this idea and hope a more amicable solution can be reached between residents, property management and Harvard. What should be the future of the Speedway property on Western Ave? Being that the Speedway site is a DCR property there would have to be state overview. However, I feel that a new school such as K-12 would be a good idea. I also like the idea of new green space. Really, there are a number of reasonable uses for this site . I'm sure whatever use is deemed appropriate will be both visually pleasing and beneficial to the community. How do you feel about the vacant Harvard-owned properties in North Allston and North Brighton? I am a little concerned that it appears Harvard has become so enveloped by their master plan that their other ventures have suffered. I only hope this is not a foreshadowing of more vacant properties to come as their Master Plan goes forward. The idea behind the public broadcasting operation’s big windows, 200-seat auditorium and modern performance center, Jonathan Abbott, WGBH’s executive vice president said, is to create a stronger relationship with the public. PMT Project List - This is a huge list of possible transit improvements in the Boston area. It includes some relative to our area, like "Add an outer Urban-Ring from Harvard Sq. to Dudley via Allston and Brookline (Route 66 routing)", adding a commuter rail stop, and extending the Silver Line. Here on the ne.transportation newsgroup is a long discussion about the feasibility and importance of the possibilities. "what I need is transportation from Allston to Kendall Square and that doesn't exist... at least not by rail." At Newton Corner, the trouble is that a new service has to comply with ADA, and at that station it's difficult. At Allston, I suppose CSX wouldn't be too happy about a passenger stop right at the edge of its freight yard." Thank you to Glory Dalton and Maria Guadalupe Rodrigues for speaking up on behalf of our neighborhood! "Urban neighborhoods have long been threatened by institutional expansion, and the negative consequences are plain to see: increasing violence, diminishing green spaces, deterioration of the urban school system, increasing traffic problems. Allston-Brighton is deeply affected by such problems and is under siege by both Harvard University and BC. The level of arrogance of these institutions is best illustrated by the BC student's statement to your reporter: "If you choose to live there, you have to expect it's not a perfectly quiet area. You knew that coming in." Many residents of the neighborhood have links to the area that go back more then three generations. It was really quiet back then. Allston-Brighton is an urban neighborhood: diverse, vibrant, and full of residents who care about their community. It will not become an urban campus." "MY FAMILY has lived in the same house near St. John's Seminary for four generations. This has always been a quiet neighborhood with young families and senior citizens until recently, when we suffered the invasion of so-called well-behaved BC students. Their revelry is not "harmless" when they wake up and frighten young children with their singing "Sweet Caroline." It is not "harmless" when they urinate on your front lawn or try to pry open your front window calling out some unrecognizable girl's name. Now BC wants to build a stadium on these grounds with lights, noisy roaming fans, traffic, and parking issues that will accompany it . The school wants to build dorms to house 600 undergraduates , all in the heart of a residential neighborhood. It will be a sad day to have to leave our family home, but the simple fact is Brighton is being squeezed by the large universities and is losing its identity." Demolition and construction are, by their very nature, loud and dirty. It is not something that is nice to live near. But Harvard's construction in Allston is unavoidable and it is also desirable, because it is necessary for the revitalization of the neighborhood. Fortunately, for Harvard's first project, there is an opportunity for a significant buffer between the construction and the community. To try to help us move towards a construction management plan that everyone can accept, I have compiled these thoughts about what such a plan might be. Hopefully this would allow for the reasonable construction of the buildings and protect the community’s quality of life. This is not intended to be a complete plan, but it tries to addresses some of the key issues. Parking for 750 cars is needed. This can be done in 6 acres of land. Harvard owns 14 acres surrounding the construction site. Six acres of parking would leave 8 acres for other construction activities. a. Emergency access can use Travis Street as Harvard has proposed. b. Keep routine traffic on the existing major roads to protect the nearby neighborhoods. c. Deliver materials and equipment during off-peak hours to minimize the impact on Western Ave traffic. d. Remove on-street parking on a portion of the north side of Western Ave and create a left-turn only lane. This could improve the flow of westbound traffic unrelated to the construction. 4) A solid, attractive barrier wall around the entire construction site (following the purple lines in the drawing below) with a green buffer of mature trees and other landscaping between the wall and community. 5) Set annual limits on the number of Saturday work days and after-hours work periods. What do you think about these ideas? Do they make sense? What should be added or changed? BC land purchases in the Globe's "Quotes of note"
Suffolk District Attorney Daniel F. Conley's office has chastised the Boston Redevelopment Authority for violating the state's open meeting laws by excluding the public from meetings with Harvard and Boston College officials about their campus development plans. Harvard physics professor Peter Galison, a 1997 recipient of a MacArthur "genius" grant, asks what might happen if a series of individually logical planning decisions result in a "dys-Allston". This literally and figuratively dark future for Allston has a science campus that is abandoned by 6:30 p.m., a museum that closes at 5 p.m., and classrooms that empty by 4 in the afternoon. Instead he hopes Harvard will create a vibrant and interesting space, full of science, art, and life. His op-ed piece is beautifully written and a great statement consistent with what many people in Allston and Brighton say when we look at Harvard's plans and fear that "another Kendall Square" is about to be built. He captures what Harvard's development could be, and I can think of nothing better than seeing plans from Harvard that make these dreams a reality. If a new Lowe's is better than the Watertown Home Depot, that would be great (and I don't think it would be too hard). But the traffic this could create on Market & North Beacon Streets? OUCH! Lowe’s Home Centers is proposing a nearly 200,000-square-foot, two-level store next to the Massachusetts Turnpike in Brighton, not far from where WGBH is moving into its new, high-profile, glass-encased headquarters. It’s slated to take shape where the long-vacant Barry Controls factory butts up against the Pike. Lowe’s would tear down the long, white concrete structure, replacing it with one of its first two-story stores in the country. The retailer hopes to start construction next year on its proposed Lowe’s of Boston store, which would employ between 180 to 200 workers. Chris Gordon, the COO of Harvard's Allston Development Group, writes glowingly in today's Crimson about Harvard's future in Allston. When Harvard publishes the Draft Project Impact Report for the Science Complex (expected sometime in June) we will have a chance to see how the details of the project match these ideals. "The Allston campus will also be permeable, welcoming neighbors into green spaces and connecting residents to its educational and cultural resources." "The urban grain of one of America’s oldest cities will be respected, and the plan for open space will embrace the green vision of famed 19th century landscape architect Frederick Law Olmsted." "new structures will be needed to bring faculty and students from various disciplines together in human-scale buildings"
"Our highest responsibility is to deliver on the promise of the great land resource Harvard has in Allston with a 50-year planning horizon. We’ll fulfill that promise when we build a remarkable campus and enrich the life of a great university, help grow the economy, and contribute to the quality of life of all in North Allston and beyond." The Future of 1501 Commonwealth Ave.
Boston's Department of Neighborhood Development considers housing developments for the former site of the Provident Nursing Home. You can call the Board of Appeal at 617-635-4775 for more info. Call (617)635-4165 for more info. The first mailing of the campaign was delivered to mailboxes all over Allston and Brighton yesterday. The candidate is Mark Ciommo, and he seems determined and ready to run a serious campaign to represent our neighborhood on the City Council. Approximately 6,600 oversized postcards were mailed (if you are a frequent voter you probably got one) at a cost of somewhere between $2,000 and $3,000. Mark has hired Mike McLaughlin to manage the campaign and he has scheduled his first fundraising event which will be Friday June 29 at 7:00 at the Brighton Elks (326 Washington St). Mark raised $45,000 in his last campaign for City Council and seems likely to top that this time. I also saw the first yard sign of the campaign this morning. It was a Ciommo sign on Franklin Street. We have been talking here in Allston about Harvard's plan for underground parking below the Science Complex on Western Ave and elsewhere on Harvard's future campus. This story tells of the Massachusetts Convention Center Authority's interest in doubling the current 1,362-space Boston Common garage. To do this, an exemption would be needed from the US Environmental Protection Agency cap on parking spaces at Boston's downtown garages (currently set at 35,303). This cap was put in place to encourage commuters to use mass transit. Harvard's new Master Plan proposes 7,345-7,545 underground parking spaces. That is a pretty big number, 1/5th as many parking spaces as in all of downtown Boston. Will the EPA have something to say about this? Harvard Crimson - Allston residents' objections are "unfounded"
“Finding out how the expansion to Allston affects the various graduate schools is a top priority,” said Christopher Laconi, who was elected president of the council last month. Incoming Harvard President Drew G. Faust has tapped a well-liked computer scientist to be dean of Harvard’s largest school, the Faculty of Arts and Sciences. Many professors believed that Faust, a historian, would choose a scientist to help lead Harvard’s major expansion in the sciences, including a new science-focused campus soon to rise on the university’s land in Allston. Colleagues and University officials say Smith is poised to address the most significant issues confronting the Faculty: general education and the expansion into Allston. Faust said she admires Smith’s core training as an engineer, which she said will enable him to bring an analytical perspective to large projects like Allston. “He takes great pride in understanding the implications of x and how x leads to y and y to z,” Faust said in a joint phone interview with Smith yesterday. Q What are the two biggest challenges ahead for your replacement? A ...The second is the development of the Allston campus. It's not a question of just who goes to Allston but how do we implement the best science program. A story from The Crimson about people who were forced out of their homes by Harvard in 1957 with comparisons to the current situation in Allston. What's happening in Barry's Corner? A huge "THANK YOU" to Mahoney's Garden Center for the beautiful addition they have made to Barry's Corner. This planter was neglected for years and regularly filled with trash and weeds. Now it looks great! Please shop at the Mahoney's on Western Ave to get healthy and good-looking plants and to thank them for supporting our community. Join us for a meeting with architecture and urban design students from M.I.T. and Harvard. We will focus on Allston and Brighton residents' vision for the neighborhood created in the Strategic Framework and outline a process for moving forward with that vision. We'll also discuss the Harvard Science Complex and Harvard’s 50-year plan and discuss how it fits (or doesn’t fit) into our neighborhood vision. Drama & Intrigue at an Allston Cab Stand! The owner of the Bayside Exposition Center in Boston yesterday proposed replacing the facility with a $1 billion residential, retail, and office development that would create a new waterfront neighborhood on Dorchester Bay. The general scope would include neighborhood-level retail shops and restaurants, anchored by a supermarket, organized around a main street and large public space near the center of the parcel, such as a village square or promenade. Additional office and hotel space would be added to the front of the property. To the rear, facing the water, would be an array of midrise residential units. Corcoran Jennison officials said they do not have a figure on housing units, but the number could range from 500 to 1,000. Orlando Perilla, an 11-year Harbor Point resident who also runs the apartment complex's community task force, said his group has been briefed on the plans several times and is pleased with what it heard. "I think it's a terrific idea that's going to totally revitalize this area," he said. "The Bayside is just an eyesore. Basically, what they're coming up with is tremendous."